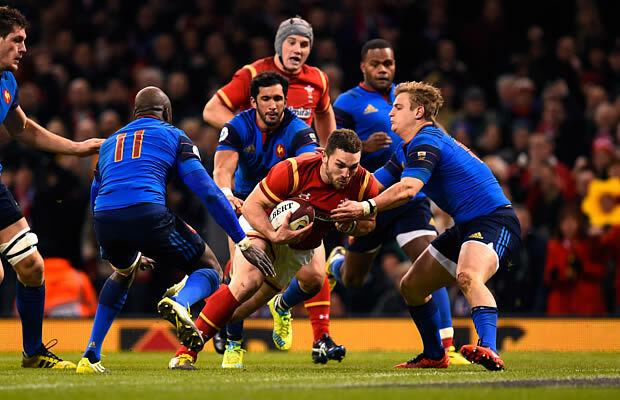 Wales moved provisionally to the top the Six Nations standings by beating France 19-10 at Cardiff’s Principality (Millennium) Stadium on Friday. The result is Wales fifth consecutive victory over France and after three matches they remain unbeaten with two wins and a draw. Both teams scored one try each and Wales scrum-half Gareth Davies was named man of the match. France’s try came at the death of the match and meant that they had gone almost 400 minutes without scoring a try against Wales. With both teams scoring the same number of tries the difference came down to kicking and Dan Biggar kicked 14 points for Wales which proved to be the difference. Warren Gatland’s Wales team were held to a 16-all draw by the Irish before seeing off Scotland 27-23 in their opening two matches, but dominated a France side also coming into the Cardiff game undefeated after wins over Italy (23-21) and Ireland (10-9). Returning to the scene of their humiliation at the hands of New Zealand in the World Cup quarter-final, France looked toothless against a well-marshalled Wales team which crucially prevented Les Bleus from scoring in a sustained 12-minute period of second-half pressure. 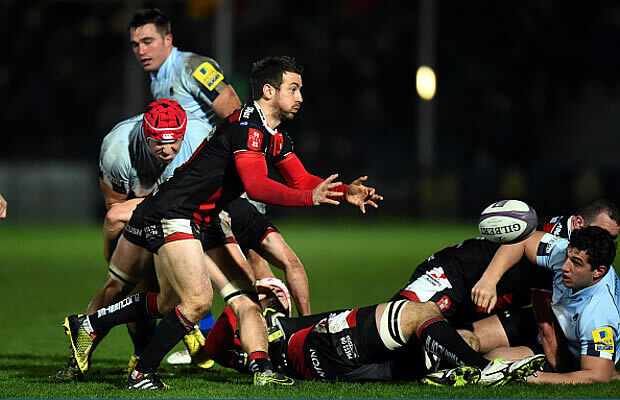 Biggar kicked four penalties, two in each half, and converted George North’s second-half breakaway try. France fly-half Jules Plisson kicked a penalty, with skipper Guilhem Guirado driven over for a consolation try converted by Francois Trinh-Duc to give the scoreline a more sympathetic glean. Wales were also left ruing their own cutting edge, dominating first-half possession and territory but failing to convert pressure into points. Plisson’s shaky start was compounded when he booted a free-kick directly into touch, handing Wales an attacking line-out. The French were penalised at a resulting ruck, but Biggar skewed the penalty. Plisson then missed a penalty of his own after Rob Evans, everywhere in the loose, was penalised for collapsing a scrum. France paid, however, after lock Paul Jedrasiak put in a late shoulder charge on Taulupe Faletau, Biggar finally getting the scoreboard ticking. After a huge hit by Sam Warburton saw opposite number Antoine Burban taken from the field, Plisson was caught holding on to hand Biggar a second penalty effort he made no mistake with. 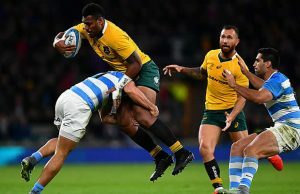 France came firing back, scrum-half Maxime Machenaud linking with Fiji-born winger Virimi Vakatawa before Liam Willams and Warburton came up with crucial tackles. Dan Lydiate, however, was penalised for a no-arms tackle, Plisson scoring France’s first three points. Maxime Medard’s boot prevented Wales’ first try after a moment of brilliance by Gareth Davies. The Welsh scrum-half broke clear of the cover and maybe should have passed with an overlap on. As it was he put in a grubber to the corner, Vakatawa missing the bounce but Medard just getting a toe to the ball as Liam Williams pounced. Biggar resumed hostilities with a third penalty early in the second period after Jonathan Danty upended Alex Cuthbert. Wales finally made their pressure pay through North. The Northampton winger had a stroke of luck after failing to tap on a ball expertly kicked through by Jonathan Davies, but Plisson inadvertently nudged it into North’s path for an easy pick-up to glide over for a welcome try converted by Biggar. France then enjoyed their most sustained period of pressure, lasting 12 minutes, but came away with nothing. Wales, led magnificently in defence by Warburton, foiled a series of attacking line-outs, held firm at the scrum and snuffed out a promising cross-kick that saw Medard go close. Biggar kicked his fourth penalty to stretch the home side’s lead to 19-3 after replacement prop Vincent Pelo collapsed a scrum. France had the last laugh as Guirado was driven over, Trinh-Duc converting. Wales travel to London next where they will face England at Twickenham while France face Scotland in Edinburgh.